Yes today is the first day we have had rain. I exhausted Elizabeth and she begged off touring in the morning in the rain. She wanted to catch up on her sleep and strength after trekking with me over the previous days. To be fair to her I walk at length every day and wear out about half the people I tour with. So what to do? I choose to go the Père Lachaise Cemetery. 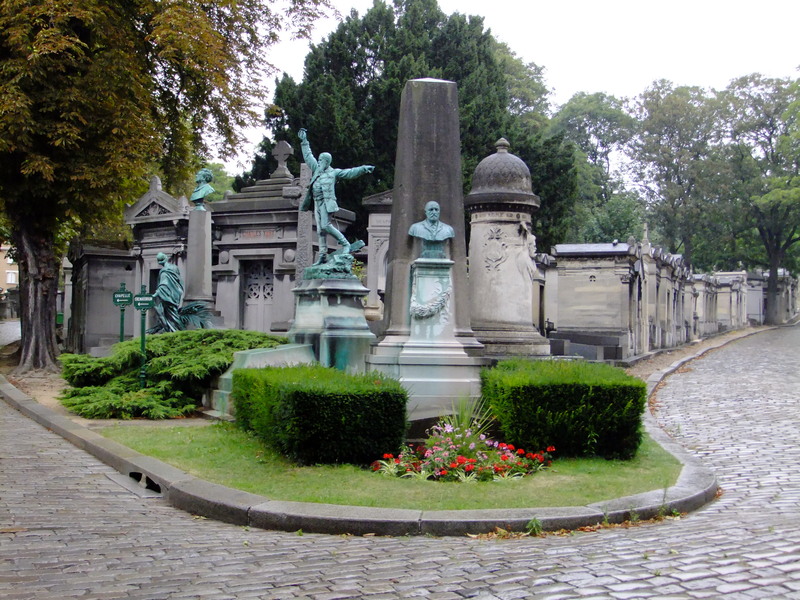 It is the largest cemetery in the city of Paris, though there are larger cemeteries in the city's suburbs. Père Lachaise is reputed to be the world's most-visited cemetery, attracting hundreds of thousands of visitors annually. plus me, to the graves of those who have enhanced French life over the past 200 years. It is also the site of three World War I memorials. The cemetery takes its name from the confessor to King Louis XIV, Pere Francoise de la Chaise, who lived in the Jesuit house rebuilt in 1682 on the site of the chapel. The property was bought by the city in 1804. Established by Napoleon in this year, the cemetery was laid out by Alexanre-Theodore Brongniart, and later extended. At the time of its opening, the cemetery was considered to be situated too far from the city and attracted few funerals. Consequently, the administrators devised a marketing strategy and in 1804 with great fanfare organised the transfer of the remains of La Fontaine and Moliere. Then, in another great spectacle in 1817, the purported remains of Pierre Abelard and Heloise were also transferred to the with their monument's canopy made from fragments of the abbey of Nogent-sur-Seine (by tradition, lovers or lovelorn singles leave letters at the crypt in tribute to the couple or in hope of finding true love). The list of famous names who are buried at Père Lachaise is almost overwhelmingly. I arrived in a pouring rain but I had brought my rain poncho and it covered me and my large Canon camera and backpack. I chose to use my small point and shoot camera since I could shelter it from the rain in my hand. The graveyard is set on hilly terrain and several “streets” wind their way up and down. Along them may be a street with people of a similar life like poets. I couldn’t find a vendor to sell me a map and visit famous graves that I would like to have but instead just wandered around. For me a photographer it was a dream with unusual tombs and symbols of death to photograph. The rain added slickness to the pictures and some of the stories on the tombstones were fascinating. I came across one grave of a gentleman by the name of Etienne Gaspard Robertson who lived between the years of 1763 and 1837. Also inscribed were the words Physique, Fatasmagoric and Aerostat. This was a large monument so I ventured around the side to see if the riddle of the three words could be explained. There sculptured in relief was a balloon above a crowd. At the time this man probably was held in the same esteem as our first aviators or astronauts. On the other side was a skeletal angel flying above a group of saved souls on one side and damned souls on the other. I remarked to myself that the ages of most the people were younger then me and many in the 45 year old range. I have become a septagenarion, if that is how you spell it. In reality I am a seasoned youth. I toured for about an hour an half in the pouring rain but had to return to my beloved and went to a taxi stand to get a taxi. You cannot hail one of the streets. You have to go to a designated taxi stand. I waited 20 minutes for the cab and arrived back at the hotel in another 20 minutes. On the way we passed the Bastille monument, the book stalls along the Seine, Notre Dame and of course the Eiffel Tower. Elizabeth and I discussed and agreed to go to the Louvre that afternoon since it was raining. Before hand we decided to visit once again the Italian restaurant we had been at and enjoyed the previous day. We cabbed over to the Franesina and had another fabulous meal. Over lunch I talked to Elizabeth about an extravagant shopping area called Galleries Lafayette. Here are hundreds of department stores and smaller well know stores up and down streets radiating some 6 blocks in either direction from a central focus of some seven streets in all. Toronto’s mink mile would be half a block here and be considered small potatoes. So the Louvre or Galleries Lafayette? I want to make my wife happy so we are going to the Louvre tomorrow. When we arrived I gave her two hours to go shopping and I went wandering. I visited the church of Madeleine to take interior photos without a flash. That was the challenge to accomplish that and improve my photographic skills. I also photographed the street scenes and especially the Opera Garnier which is also know as the original Paris Opera house. I also visited an Apple Retail outlet that was housed it was a former huge Bank building. I wandered 10 blocks away and returned to meet Elizabeth in the biggest store with at its heart and open space four stories hight that was under a fabulous tiffany like dome at the top. We grabbed a cab and returned to the hotel. Dormi, Dormi for a couple of hours and then to a Bistro a block away for supper since it was raining. Then back to Hotel Muguet to dream until the morning.